This week, Joe Sebok gave two interviews to address the recent announcements regarding the UltimateBet superuser scandal. If you recall, over the past few weeks, Travis Makar released two e-mails, one that contained a “God Mode” attachment and one that centered on a blackmail situation between UB COO Paul Leggett and Zoltan “Brainwashdodo” Rozsa. On Wednesday, March 2, 2011, Sebok sat down with Mark Gahagan and Matt Kaufman of CardRunners for an interview regarding Makar, the missing UB histories, and to present some answers from Leggett on previously posed questions. To kick things off, Sebok claimed that UB attempted to reach out to Makar but had difficulties connecting. When asked whether Makar had reciprocated their attempts to communicate, Sebok was unsure but emphasized he wanted any and all information to be released if at all possible. The hosts went on to ask whether UB would be prepared to offer refunds if missing hand histories -- which are 10 percent of the hands associated with the superuser accounts -- were revealed and showed that additional accounts had been cheated. Sebok responded that he believed so but that many critics would never be satisfied no matter what the new UB does to rectify the situation, and that at some point you have to say “enough is enough” in regards to the refunds. *The act of considering to pay, not actually paying, which Sebok agreed would be wrong. Late in the interview, the host revealed that they had given Sebok questions to pose directly to Leggett. Sebok had done just that and brought back answers discussing a number of issues. First, Leggett wanted to clarify a previous statement that he had never met nor spoken with Russ Hamilton. Leggett’s response confirmed that he had never met Hamilton, but that he did in fact speak with him once during the early stages of the superuser investigation. Second, the rumor that Leggett sent armed thugs to Rozsa’s house to intimidate him was not in context. Instead, it was simply a company guard sent to verify Rozsa’s home address. Finally, Leggett confirmed that no one working for or involved with the current UB company was associated with the cheating scandal. Sebok went on to urge anyone with information -- whether it be Makar, poker media outlets, or even Haley Hintze -- to make it available to everyone. Hintze, of course is the woman who has taken it upon herself to conduct an in-depth investigation into the superuser scandal, often revealing her findings in her blog. Speaking of Hintze, in her latest post, dated February 28, 2011, she examined the aforementioned e-mail in detail and previewed the focus of her upcoming post. He wants the information to come out and urges Makar, and anyone else with pertinent information, to come forward. Just because a company doesn’t want information to come out does not necessarily mean it is “cheating” related. If he finds out Leggett has been lying and the new UB played a role in the cheating scandal, then he will leave the company. While Sebok did not necessarily present new information, the interviews drew a lot of attention from the poker community. Some were reassured by Sebok, while others were not convinced; for example, Todd Witteles, one of Sebok’s biggest and most outspoken critics took to the DonkDown forums and offered his opinion on the latter interview. Given the fact that Hintze is preparing to release more information, and that Makar continues to withhold his evidence, it is clear the UltimateBet superuser scandal drama is far from over. As always, PokerNews will be here to bring you any and all developments as they happen. New WSOP Media Rules to Combat Blogger/Reporter Tournament Cheating...Are They Fair---or Ridiculous? I have been blogging about the recent poker tournament cheating scams where players are using reporters and bloggers who sit and hang around the tables ostensibly looking to interview players and report on the action but who are really looking at the players' hole cards and signalling those values to players they are in cohoots with. The biggest reporter/blogger poker tournament cheat scam so far involved Ali Tekintamgac on the Partouche Poker Tour; he won the WPT event in Barcelona but was accused of using fake bloggers to spy his opponents' hole cards. So now the WSOP rules committee has decided to implement two new rules to combat this type of collusion cheating, which is indeed serious and has that very type of repercussion on the outcome of final tables and near final tables during a poker tournament. The first new rule that is to protect the integrity of the tournament and the security of the players and staff, according to a WSOP spokesman, is that no members of the media will be permitted at any single table for more than 5 minutes during each half hour. Well, this is a bit hard to digest, especially when reporters and bloggers are looking for big names involved in big pots. 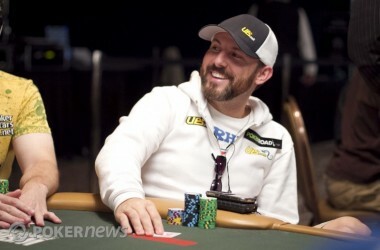 It often takes more than five minutes for a big pot to develop and play out, therefore reporters and bloggers would not be able to stay and cover that type of action, which is highly coveted by poker fans in front of TV and computer screens. The second new anti-media-cheat poker rule is that members of the media will not be permitted to talk to players while cards are on the table. This will have the same type of negative effect as the first new rule and will also force bloggers and reporters to reduce the details on hands and strategies recounted by players involved as well as the general poker talk and entertaining stories related to the play of tournaments. My take: I think these new anti-poker-tournament cheat rules are exaggerated. In fact, better than to iniciate this would be to increase the scrutiny on who the reporters and bloggers around the tables actually are. Since Ali Tekintamgac was accused of using FAKE bloggers with no legitimate accreditation and that the vast majority of these reporter/blogger poker cheats have no real affiliation to any accredited blog or media source, we in the poker world would all be better served by a format that really checks out all reporters and bloggers attending major poker tournaments. Foxwoods, Casino Cheating Capital of the World, Strikes Again! Like I have always said, this giant casino in Connecticut called Foxwoods, has always been, and will always be, the casino cheating capital of the world--for both inside and outside casino scams. The latest is another huge dealer generated cheating scam on Foxwoods' pai gow tables. A Foxwoods dealer from Norwich and two alleged accomplices were arrested Tuesday on charges they worked together to cheat while playing pai gow at the casino. Pai gow dealer Chen Xiuhie, 29, of 158 Summit St. in Norwich, was arrested with casino patrons Guang S. Li, 37, of Braintree, Mass., and Norman Chun Tung Wong, 38, of San Francisco. All three were charged with two counts each of third-degree larceny, conspiracy to commit third-degree larceny, cheating and conspiracy to commit cheating. Chen was released on a $5,000 cash bond and is due to appear March 22 in New London Superior Court. Wong and Li were held on $50,000 bond and were expected for arraignment Tuesday in New London. Police said they anticipate future arrests. Thirty-two-year-old Tan Tiong Loon has just become the the first person in Singapore's young history of legal casino to gambling to be found guilty of cheating a casino in a partnership with a casino dealer. The already charged car-thief was out on bail for boosting cars when he committed the casino cheating offense last October 7th. Loon convinced 24-year-old dealer Keith Yong Kee-Hwei to cheat his big money wheel game for fifty percent of their ill-gotten winnings. Yong Kee-Hwei was able to manipulate the spin of the wheel with his hand on two different spins to get the big winners that totalled $31,500. Supposedly a Chinese gambler not involved in the scam caught on and ratted the pair out (tough break). The dealer has also been charged in the casino cheating scam but his case has not yet gone to court. I guess he will probably take a plea. My take: Well, I always say: better to cheat casinos without the dealer-help. Problem is, hardly anyone is capable of doing that effectively.